KATHMANDU, April 25: Student unions affiliated to various political parties have decided to padlock the accounts sections and administrative offices of private schools from Wednesday against the schools' unilateral fee hikes. Organizing a press meet on Monday, the student unions publicized the schedule of their protests against the fee hikes. The student unions are Nepal Students' Union, All Nepal National Free Students' Union, All Nepal National Independent Students' Union-Revolutionary, Tarai-Madhes Students Front, ANNFSU-Sixth, Rastriya Prajatantra Students Union, ANNFSU-Fifth and Naya Shakti Students' Union. "We have decided to organize various forms of protests beginning Tuesday as the government has not given any attention to slash the fe”s," said Pushpa Kumar Shahi, vice president of the Nepal Students' Unio“. "We will stage sit-ins in front of all the district education offices on Tuesday, and padlock the accounts sections and administration offices of the private schools from Wednesday," he added. The protest programs also include padlocking the offices of the private schools' organizations on Thursday and boycotting the private schools organizations' office bearers in public places. 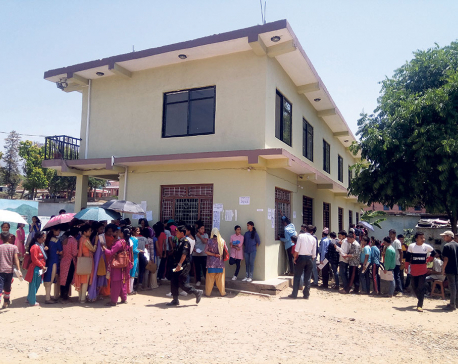 They have also urged the Tribhuvan University not to implement the semester system in Kathmandu Valley colleges from this year and conduct the Free Students Union elections in all the colleges simultaneously after the local elections. The student unions had submitted a three-day ultimatum to Education Minister Dhani Ram Paudel on April 18 demanding scrapping of the hiked private school fees. Various private schools have arbitrarily increased the fees for the new academic session which started April 14. The schools did so without taking permission from the authorities concerned. Some schools were found to have increased monthly tuition fees by up to 60 percent and some had charged Rs 1,000 for admission forms. Also, some schools were found to have charged an unspecified annual charge of Rs 60,000 to students promoted to higher classes. The private schools have also been forcing the students to buy textbooks, exercise books, uniforms and other stationery items from particular shops in order to reap commissions, claimed the office bearers of the Guardians Association Nepal. The association further informed that the students are not provided any discounts in their purchases. "We have asked the private schools to fix the fees in line with the provisions, rules and regulations concer”ed," said Dr Hari Prasad Lamsal, spokesman at the MoE. A new fee structure of private schools must be approved by two-thirds majority of guardians and then the schools must take permission from the Fee Restructuring Committee and the District Education Office (DEO) before increasing the fee. Five years ago, the Supreme Court had directed the private schools not to increase fees before a lapse of three years. But most of the schools were found to have ignored the court order.